Applications are now being accepted for the 2014 Marian Anderson String Quartet Community Music School to be held June 4-14 & June 18-28 in Bryan, Texas. We welcome students from age 7 to adult who wish to further their studies in strings, piano, flute, clarinet or french horn. 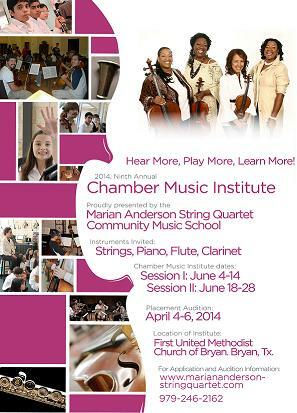 This entry was posted in Chamber Music Institute, News and tagged 2014, community music school, summer cmi. Bookmark the permalink.